Das Grubenrettungsfahrzeug MRV 9000, das die Drägerwerk AG & Co. KGaA, Lübeck, gemeinsam mit dem kanadischen Bergbauunternehmen Goldcorp Inc. sowie der deutschen Hermann Paus Maschinenfabrik GmbH, Emsbüren, entwickelt hat, setzt neue Maßstäbe bei der Grubenrettung. Es wurde bei der International Mines Rescue Body Conference (IMRB) am 8. September 2015 in Hannover erstmals öffentlich präsentiert. If anyone wanted to summarize 21st century mining in a few words, these would be deeper, longer, and more complex. Today, technical progress and the economic realities of mining drive mines to greater depths and distances in the search for valuable mineral resources such as gold, iron ore, salt or potash. This expansion underground also brings new challenges for rescue personnel – in emergencies, it is all important that they are able to reach the most remote parts of mines and safely return from their mission. The breathing air supplies that can be carried or transported by rescuers are one of the most important factors for planning of escape and rescue operations. An innovative response to this challenge can be seen in the Musselwhite Mine in northwestern Ontario, operated by the Canadian mining company Goldcorp Inc. The MRV 9000, a new type of mine rescue vehicle, is developed by Drägerwerk AG & Co. KGaA, the german technology company, based in Lübeck, in cooperation with Goldcorp and Maschinenfabrik Hermann Paus GmbH, Emsbüren/Germany (Figure 1). The development history of the MRV 9000 illustrates how the fruits of close cooperation between a safety-oriented mining company, a supplier of medical and safety technology, and a manufacturer of mining vehicles can carry mine rescue forward into the 21st century. A risk detected is a danger less! The MRV 9000 enables safety and rescue crews to reach even the most remote areas of a mine in good time, without the limitations previously dictated by the capacity of breathing apparatus. Goldcorp identified the changing risk profile of deeper and longer mines five years ago and began his search for potential solutions to the situation with a program of tests and simulations. Mining at Musselwhite began in 1997 and, in the meantime, has reached a depth of 1,200 m. In 2014, annual production from the mine was around 278,000 ounces of gold. This yield comes at a price: The horizontal extent of Musselwhite Mine has meanwhile grown to 12 km from the ramp access. Goldcorp’s investigations also revealed that, in view of this spatial expansion, rescuers were rapidly approaching the limits of existing mine rescue technology. Even in good visibility and at a speed of 25 kph (15 mph), it would take a team around 45 minutes to get to the remotest corners of the mine. Rescuers would have to don their breathing apparatus on the way to the incident, and depending on the call-out scenario would have only up to four hours of air at their disposal. In the worst case scenario, rescue teams could reach the scene of the incident, but, as the remaining air of their breathing apparatus reached the critical level of 50 %, would have to cancel their mission and return to base. The bottom line of the analysis: Those mines are beyond the range of the existing breathing apparatus. This problem is by no means unique to the Musselwhite Mine, it also applies to other Goldcorp mines and the mines of other operators around the globe. Goldcorp’s research provided an innovative vital spark. The experts of Goldcorp and Dräger spent months playing through several scenarios that might safely and efficiently solve the problems of insufficient range for underground rescue operations. They investigated and threw out various ideas, e. g., stockpiling breathing apparatus at various locations underground, or a rescue capsule to be towed behind existing vehicles. As there were no readily available solutions on the market, the only way left open was to design a new vehicle. Kent Armstrong, Dräger, remembered an underground fire at the MacIntyre Mine in Canada in 1965. The incident, at a depth of around 1,500 m (almost 5,000 feet), made it very clear to rescuers that breathing apparatus for two-hour rescue missions were no longer sufficient for safe and efficient operations at ever-increasing depths. Dräger’s BG 174 closed-circuit breathing apparatus first closed this safety gap in the mid nineteen-sixties. It provided search and rescue teams with breathing air for up to four hours. But today, even this standard is far from sufficient when the journey to and from an incident at the farthest point of a mine can take almost two hours. At the same time, the further development of mobile systems is limited by physical factors, because nobody can carry a system with air for eight or nine hours on the back. Simple improvement of rescue team mobility is also no viable solution to the problem. Rescue vehicles that drive into mines like an all-terrain ambulance, fight fires, and provide first aid to the injured while miners hold out in emergency shelters and rescue chambers are nothing new. Solutions like these have been in use for the past few years. What was missing, was a vehicle with a self-contained air supply that would be completely independent from the surrounding atmosphere. In the discussions between Dräger and Goldcorp it crystallized out that the best solution would be a vehicle with an air-sealed cabin and cassette or in other words, a mobile rescue chamber in which the rescue team can safely make the journey to an incident and only needs to don personal breathing apparatus immediately before leaving the cassette on arrival at the scene. 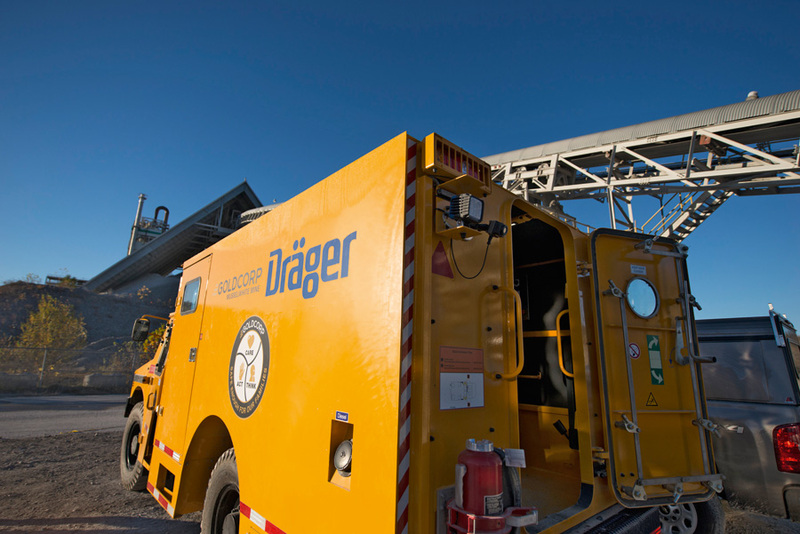 The experts at Goldcorp and Dräger designed this mobile rescue chamber with all-wheel drive. While still in the planning phase, they located Paus, an engineering company, spezialised in the constructoin of mining vehicles. The team worked on this project for two and a half years from initial drafts to the finished vehicle, a period in which the three companies were to work on, and frequently revise, the technical specifications. 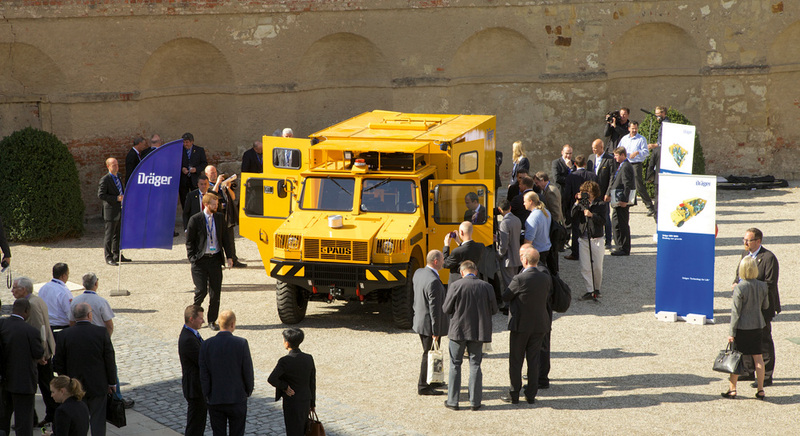 The MRV 9000 was finally unveiled at the International Mines Rescue Body Conference in Hanover/Germany, on 8th September 2015 (Figure 2). A short time later, it was subjected to evaluation testing under realistic conditions at the Mine Emergency Response Drill of the American Mine Safety and Health Administration (MSHA) in Missouri. The vehicle offers innovations at a number of different levels that, in combination, allow safe transportation of rescue personnel to the immediate vicinity of the incident location. With a top speed of 33 kph (20 mph) and climbing power for grades of up to 60 %, the vehicle is equipped for deployment in rough terrain in mines. Fully loaded, the vehicle weighs in at around 9 t (20,000 lbs) and, as both the cabin and the cassette are equipped with air purging systems that provide the crew with fresh breathing air, is non-reliant on ambient air supply. Depending on the number of persons carried, the MRV 9000 offers deployment times of up to five hours – 90 minutes to reach the destination, two hours at the incident location, and 90 minutes for the return to base. The vehicle can be readied for subsequent missions within a time-window of 45 minutes. As soon as crew members with personal breathing apparatus have left the vehicle, the air supply can be regulated down to meet the needs of the remaining crew onboard and economize on breathing air. In all, the cabin and the cassette offer seating for nine persons and space for a rescue basket or stretcher for the recovery of injured miners. The capacity of the MRV is therefore significantly higher than the mandatory rescue team capacity of five persons stipulated by the Canadian authorities. In the vehicles already deployed by Goldcorp, breathing air is supplied by a total of six 6,000-psi compressed air cylinders installed in two groups of three cylinders each on both sides of the front section of the cassette. To have the vehicle ready for the next mission in the shortest possible time there was developed a hydraulic lift system that allows empty gas cylinders to be removed and replaced within 15 to 20 minutes. 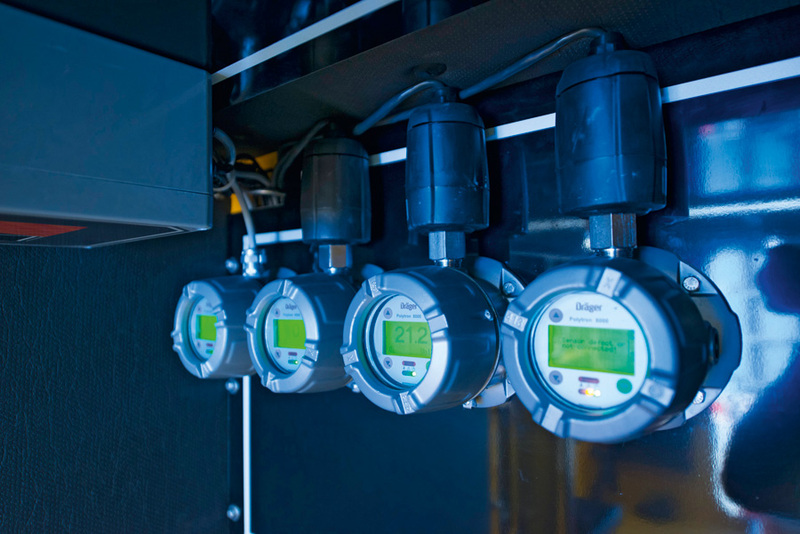 The vehicle also features a comprehensive gas detection system that measures exterior concentrations of oxygen, nitrogen dioxide, methane and carbon monoxide as well as oxygen, carbon dioxide and carbon monoxide inside the vehicle. The crew is warned by optical and acoustic signals when threshold values are above or below defined threshold values. The sampled values are also clearly visible in the front cab and rear chamber (Figure 3). Integrated thermal imaging cameras on the front and rear of the vehicle have taken the place of hand-held equipment. Three monitors, two in the cab and one in the cassette, provide the team with orientation in dusty or smoke-filled environments and assist them in searches for missing persons. Before the idea could be realized, all three companies had to get together around the table for regular discussions to enable the concept to grow from initial sketches to fully-fledged, detailed construction plans. The first real challenges the team had to face appeared in the concrete planning and realization phases. At first glance, the project was about designing an autonomous rescue chamber on wheels and installing it on an existing chassis. However, time and again in the discussion of the precise design specifications, the three companies encountered practical issues that demanded modifications to the concept to ensure effective and safe utilization of the vehicle in its future role. This led to the concept of providing the cabin and the cassette with independent air supply systems. Practical testing also revealed that the vehicle’s seat ergonomics would have to be adapted to the needs of the rescue crew. As rescuers strap their personal breathing apparatus on their backs on each mission, the front seats of the MRV 9000 are constructed without backrests. Additionally, the design of the doors had to be modified to allow fully-equipped rescuers unhindered access when leaving and entering the vehicle. The idea of a hydraulic lifting system for easy and rapid replacement of the compressed air cylinders carried onboard – like replacing a set of batteries – was also a result of the close cooperation. Still in 2015 the first two examples of the MRV 9000 were delivered to Goldcorp and are now ready for their first call-outs at the concern’s Musselwhite Mine and its Porcupine Mine in Timmins (Figure 4). The first feedback received from other mining companies is positive. 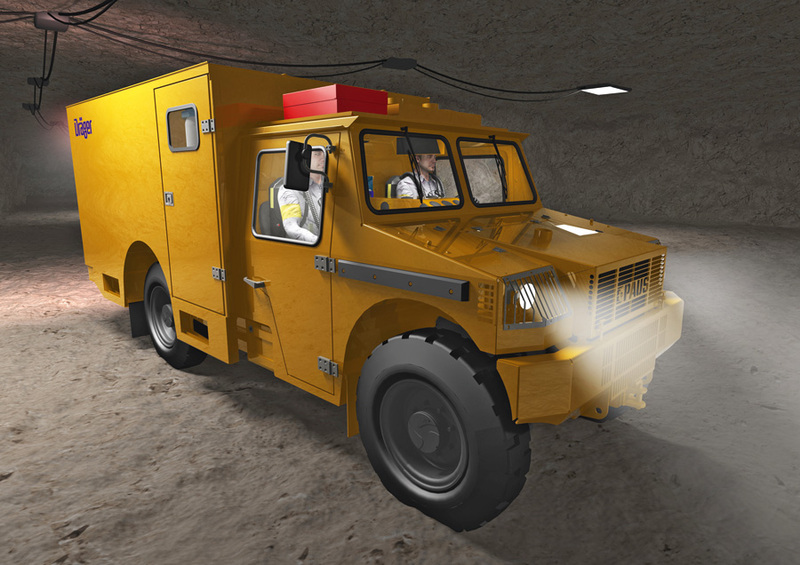 Nevertheless, the MRV 9000 must first earn its place as a component of a modern safety and rescue concept of a mine. The mining industry has taken note of the development and must now think about whether and how it fits in with their own, individual safety concepts. This brings with it modifications to dimensions and equipment determined by the specific needs of a mine and national legal requirements, e. g. regarding motorization or the size of a rescue team. Seen in this light there is no such thing as a mine rescue vehicle universally suited to every mine. But now there is a reliable answer to the question of how mine rescue can work safely and efficiently in the 21st century.